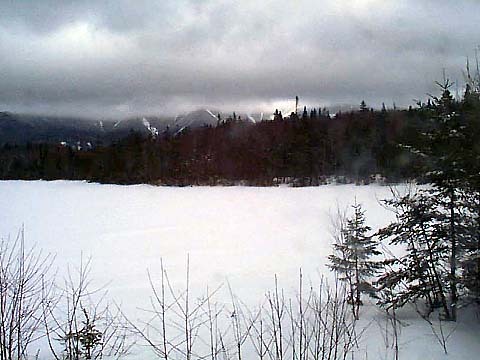 The day began with light snow and about 30 deg at the Lonesome Lake trailhead. It got a little colder as I climbed higher, down to about 20-25 deg, and probably got into the 40s at the bottom. 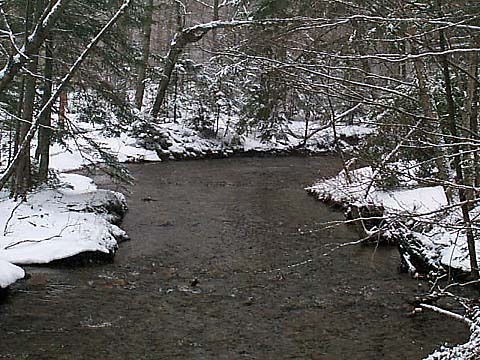 The snow was on and off all day, mostly off, but it stayed cloudy with patchy fog. When I got to the summit, there was fog at the tops of all the higher mountains, starting around 3900 ft. There was about 1-2 feet of old snow at the bottom, going to maybe 3-4 feet higher up. The trails were mostly packed snow and ice covered with 1-5 inches of new powder. I had to stay in the very middle of the trails to avoid postholing. 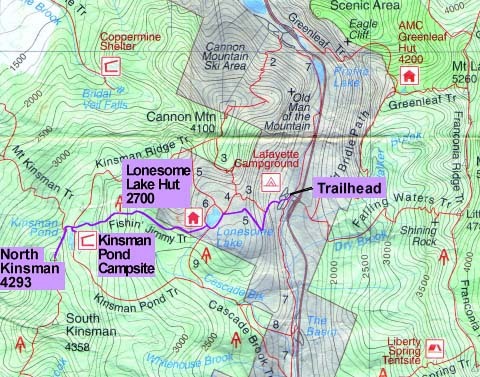 I parked the car at the Falling Waters/Old Bridle Path trailhead, went under the tunnel, and started up the Lonesome Lake Trail around 7:30 AM. 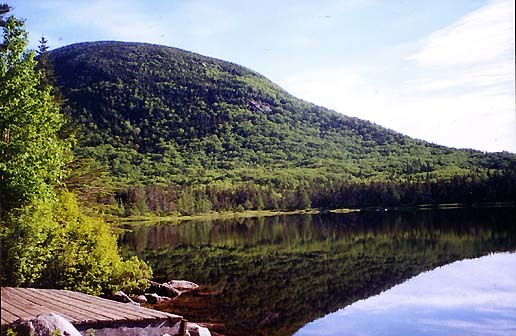 The hike up to Lonesome Lake was not difficult. The trails were fairly solid and the width of the packed area was relatively wide. Having been that way several times in the past, it was a familiar hike, although this was my first time up to Lonesome Lake in winter conditions. I could hear and see the cars down in the notch better than usual with the leaves off the trees. I was glad to pass out of range of the highway noise when I reached the plateau at the top of the last switchback. It took me just over an hour to reach the north shore of the lake. I stopped to take a picture across the lake to the hut. At that time of day, it was pretty foggy, even down below 3000 ft. The lake was totally covered with ice and snow. The trail around the lake was a lot easier than usual because of the snow, which totally covered the timber puncheons that you usually have to balance on to avoid the mudholes on the trail. After reaching the south shore of the lake, I stopped for a couple of minutes to take some pictures, then climbed the rest of the way up to the hut where I rested for about 10 minutes on the porch of the lower bunkhouse and ate a power bar. The doors of the hut and bunkhouses were all bolted shut for the winter. Crossing the Pemigewasset River. A bridge over the river connects the parking lot and the start of the trail at Franconia Notch State Park's Lafayette Place Campground. 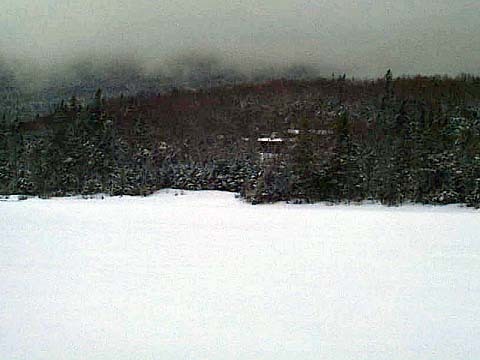 Looking across Lonesome Lake to the hut and the fog-obscured ridge running up to one of the Cannonballs. 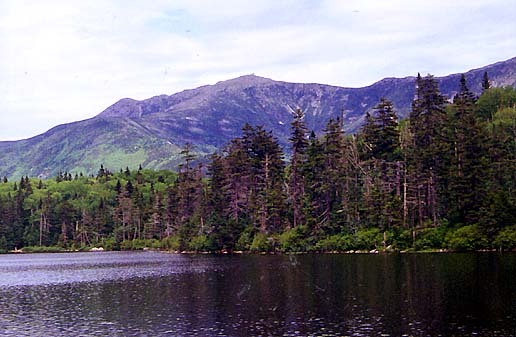 Lonesome Lake and Foggy Franconia Ridge from Lonesome Lake Hut. On a clear day, this is a spectacular view. 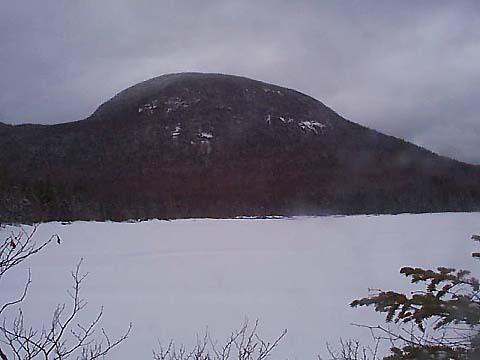 North Cannonball from the shores of Lonesome Lake near the hut. 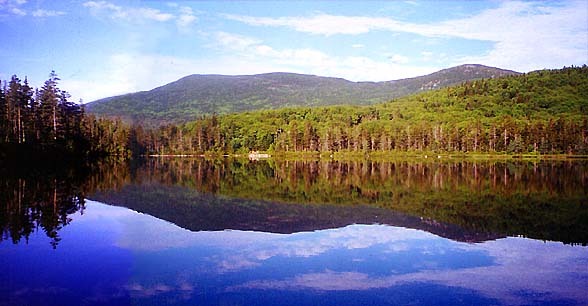 The Cannonballs are two small humps between Cannon Mtn and the Kinsmans. The Lonesome Lake Hut dining room and croo quarters. 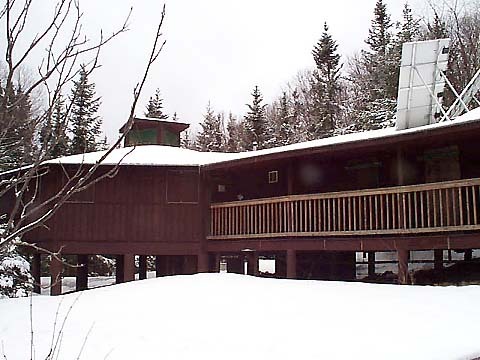 There are also two bunkhouses and a Clivus composting toilet.